Dark Souls II desperately needed Crown of the Ivory King‘s frozen wasteland. The third of the game’s three announced downloadable expansions is the best of the bunch, with the most elaborate environment, the most challenging enemies, and the most variety overall. 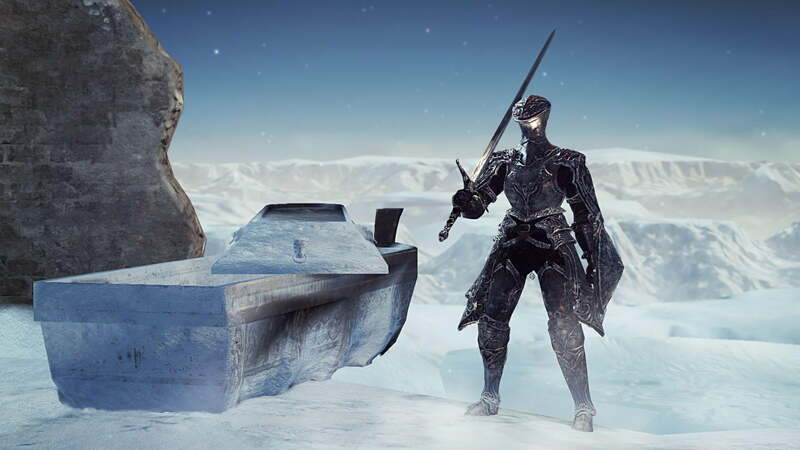 But above all Ivory King really stands out for its icy vistas and blizzard-wracked plains, their snowy aesthetic breathing cold, fresh life into Dark Souls II. This final expansion is the only one that begins from an existing point in the game instead of a new area added with the DLC. 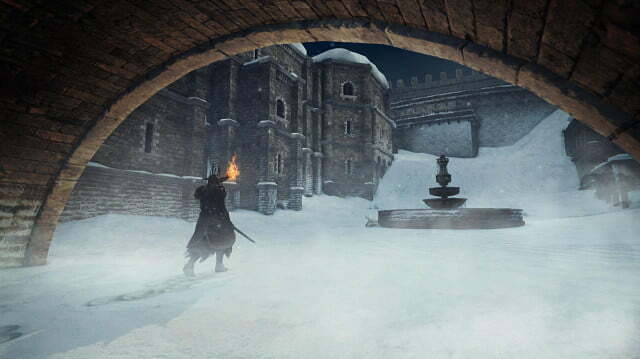 And it’s easy to guess where: The Shrine of Winter, located on the path to Drangleic Castle. The shrine previously served only as window dressing, but it’s received a makeover with Ivory King and touching it will now transport you to the frosty city of Eleum Loyce. 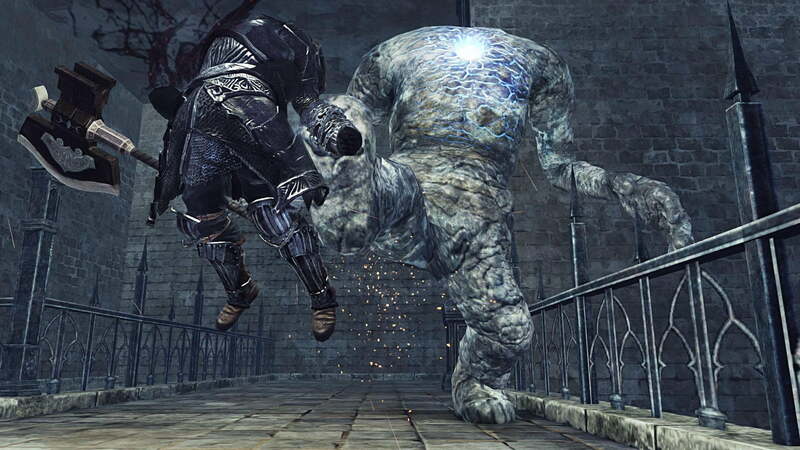 Like the other new locations added to Dark Souls II, Eleum Loyce is not exactly in its prime. The town’s battlements, rooftops, and fortresses are arrayed with orderly care, but long ago its King was forced to sacrifice his own soul to keep Chaos – a force familiar to Dark Souls players – at bay. 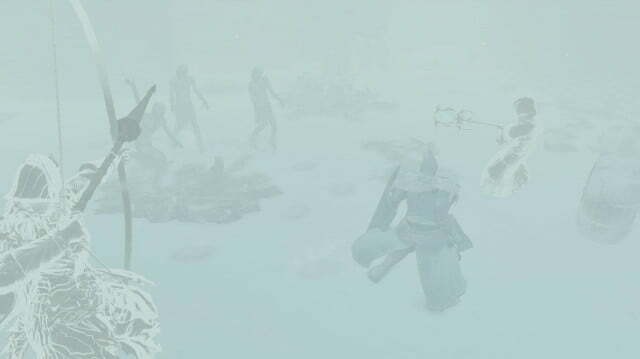 His absence allowed a curse to bury the kingdom in snow, gales of white wind obscuring your vision and preventing you from lighting any torches. Even the city’s treasure chests are locked in blocks of ice, which should be your first clue that something has to be done about the weather. Like the Iron King expansion before it (and unlike the Sunken King DLC), Ivory King features what is essentially one massive area and one smaller but more difficult optional location. Eleum Loyce is easily the most detailed of the expansions’ environments, its complexity eclipsed in all of Dark Souls II only by The Gutter. That’s partially because there’s no clear path forward – Eleum Loyce harkens back to the structure of Dark Souls even more than Sunken and Iron did, and encourages nonlinear exploration. 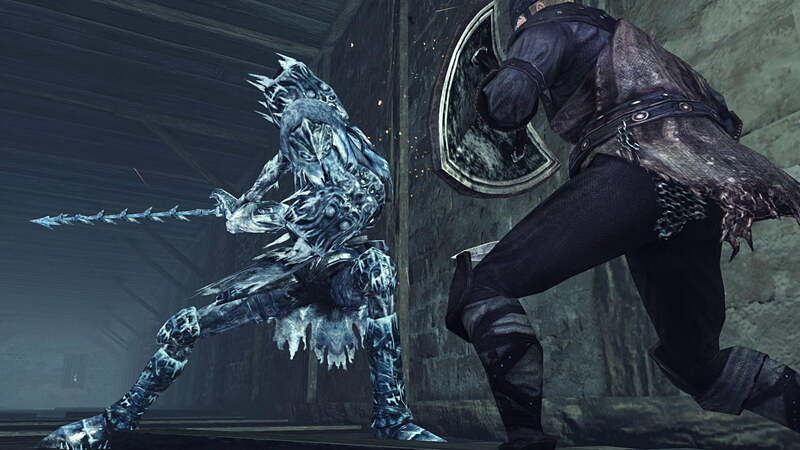 You’ll be forced to backtrack extensively, especially once you figure out how to lift the curse, unfreezing certain paths that were previously blocked. You’ll emerge from a doorway and glimpse areas you’ve been to previously, or ones you know you’ll have to visit eventually. 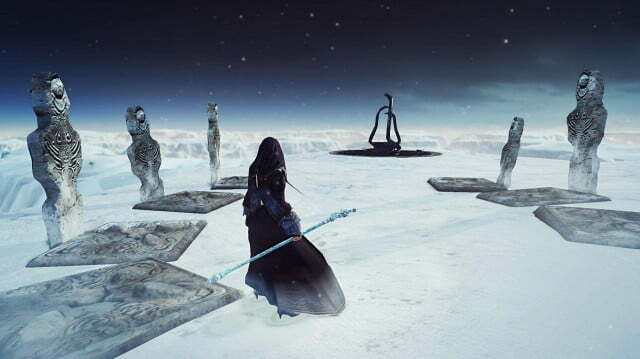 Ice warriors who can form their limbs into hammers or lances pop out of the snow as the city’s forlorn retainers, robed mages with vicious icicle daggers, drop in on your from above. Hidden elevators create shortcuts and make you reconsider the best path to take through Eleum Loyce’s towers, curtain walls, and courtyards. 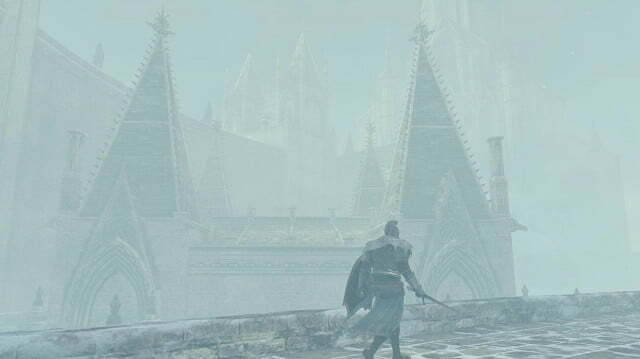 You’ll be desperate, fresh out of healing Estus with frozen rabid dogs hot on your heels, only to stumble up a flight of stairs and find yourself exactly where you needed to be. 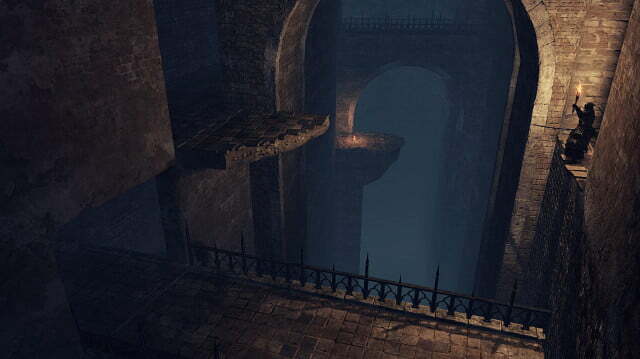 This honeycomb-like architecture, which feels simultaneously intimate and grand in scale, is among the best the Souls series has offered. You’ll explore from the city’s dripping depths to its gusty, frigid heights in search of knights to aid you in the final boss battle, discovering fresh challenges around every corner. Developer From Software has really gone overboard with the vertical skirmishes, and you’ll drop in on foes even as casters and mages hurl spells at you from above. One enemy behaves and looks so much like another player, fleeing when his health depletes and baiting you into aggravating other enemies, that you might actually find yourself wondering if you’ve somehow been stealthily invaded. Strangest of all is the fact that you can technically defeat the forsaken Ivory King himself almost from the first minutes you enter the new Ivory King content. Here’s how that would play out: When you entered Eleum Loyce, you’d choose to head left at the first fork. Through the fog gate, you’d defeat a stomping, growling boss that is literally invisible. 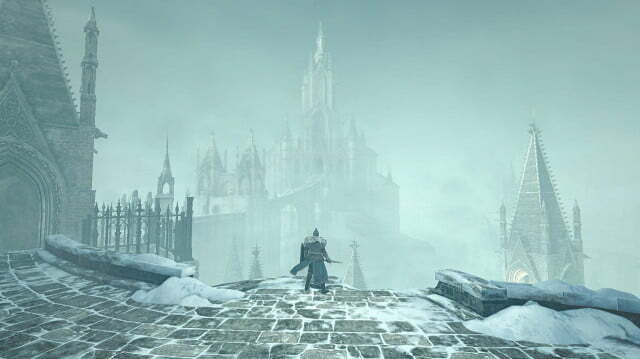 Then up a long stairway to the city’s grand cathedral and, following an informative conversation (one of the few bits of actual exposition in all three expansions), you’d head through another fog gate and confront the final boss. But that first boss is practically impossible until you find the item that allows you to see it, and the final encounter is no less challenging unless you’ve plumbed the city’s depths for the wayward knights that will help in the fight. 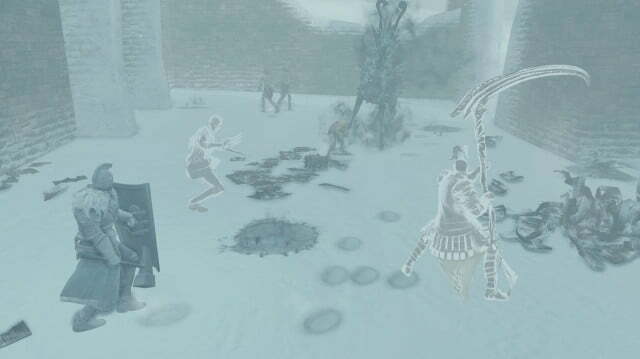 Mechanically, this battle is unique to the entire series; you don’t summon these allies, but find them waiting as you approach the Ivory King’s fog gate. 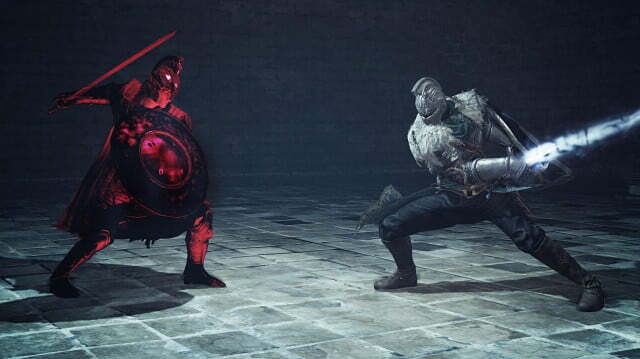 During the fight they take crowd control duty and eventually prevent extra enemies from spawning as you focus on the boss, making them invaluable. As usual for Dark Souls, none of this is explained, but the first time you encounter a sad-looking NPC who dissipates before your eyes to “seek the chaos” you’ll understand that this is a good thing. 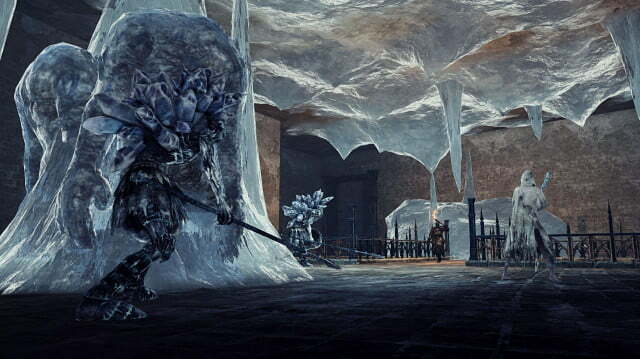 With proper preparation, those boss fights aren’t as frustrating as the Iron King expansion’s were, but this DLC’s optional challenge area is another story entirely. 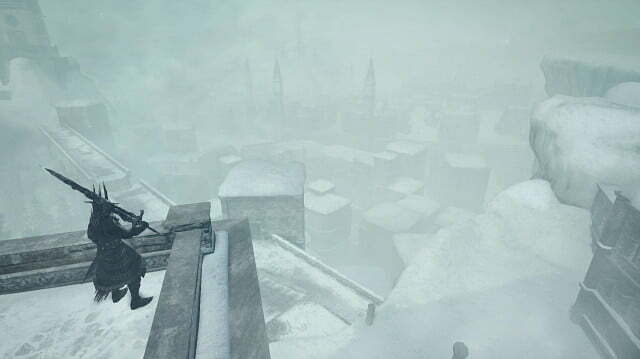 The “Frigid Outskirts,” as it’s called, is an icy basin plagued by blizzard gusts so strong that you can’t see more than a few feet in front of your character. 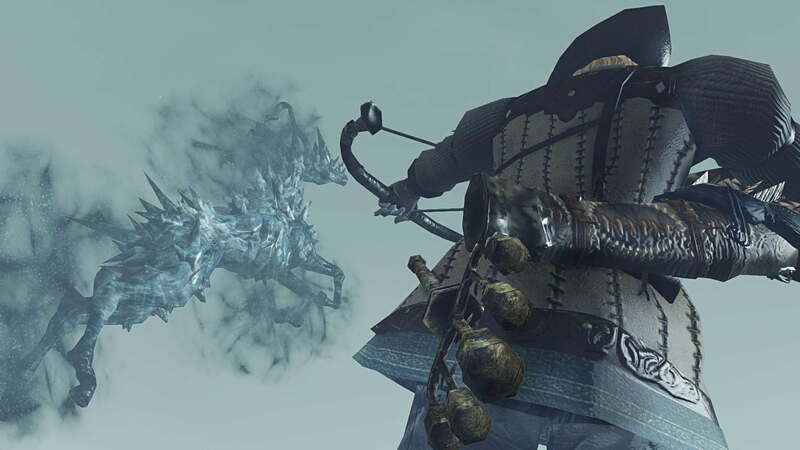 Every minute or so these clear up for a few seconds so you can get your bearings, but other than that you’ll be running blindly as powerful knights and lightning-spewing “frozen reindeer” that are the size of large horses charge at you from all sides. These things are a serious pain, and good luck to you if you’re unfortunate enough to draw the ire of two at once. Even with two human phantoms in tow this level will test all your skills in the best way possible. One of the best aspects of these three expansions is that they don’t just offer more places to explore, harder enemies to kill, and superior equipment to discover. The environments feel distinct from the rest of the game, the enemies are smarter and more varied, and the gear is weird and different, not just better than the main game’s loot. 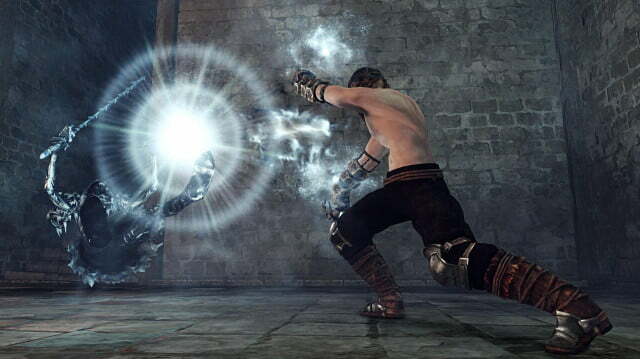 With how detailed all of Dark Souls II‘s systems are, there will always be room for rings, weapons, and armor that have unique effects or specs, and Ivory King offers plenty of interesting new items to discover. It’s frankly incredible that From has this much creativity in reserve, and it makes you wonder whether the team there will ever run out of ideas. When the third of these expansions’ forlorn kings has fallen, you’ll be wise to pay a visit to the tomb of the king who featured heavily in Dark Souls II‘s main story. 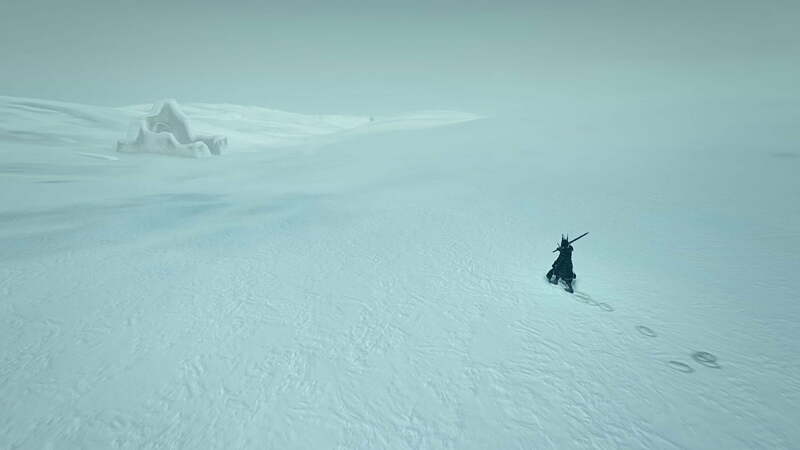 There’s an interesting encounter there, and you might even gain a new ability that’s never been featured in the series before: To weather death without losing your humanity and going hollow. 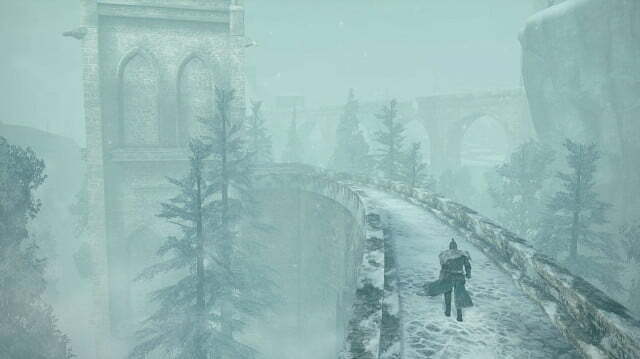 That’s From Software proving it will always have something new up its sleeve. No matter how many hours you’ve put into these games, and that no matter how challenging the series can be, the reward is always worth it in the end. This game was reviewed on PC using a code provided by the publisher.